Get Straighter Teeth with Invisalign in Virginia Beach! Going through old photos, you come across your last beach visit. You remember those old days so well and cherish the memories you made with all your friends. However, as you look through them, you realize that you never showed your teeth in any of the group photos. It’s in that moment that you set the photos down and start to research. 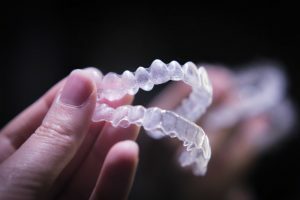 You may have noticed that there’s Invisalign in Virginia Beach available, but you’re not sure what the process entails. Soon, you’ll find out the many aesthetic as well as functional benefits straighter teeth can offer. Invisalign is a clear aligner that’s designed to reshape your teeth and create a straighter smile. This cosmetic brace helps adults and teens who are looking for a less-invasive and more convenient solution to overcrowding, overbites and underbites. The process is quite simple. First, your dentist takes a mold of your teeth and sends it to Invisalign, who creates a set of trays that are similar yet slightly different that your current smile. Once fabricated, you’ll wear the aligners throughout the day and night, only removing to eat and brush as usual. Every few weeks, your dentist will give you a new aligner that fits closer to your straighter teeth and you repeat the process. Eventually, your teeth will have shifted into a new straighter position, making oral tasks much easier and providing other health benefits. If you’re gums have ever become swollen or red, it’s possible this occurred due to overcrowding in your mouth. This can also increase your risk of periodontal disease. However, when your teeth are properly aligned, it helps your gums fit more securely around your teeth, creating a stronger defense against bacteria. This will also make brushing and flossing easier since your teeth are easier to access. How Does Straighter Teeth Improve my Overall Health? When you look at your gums in the mirror, think of them as a passageway to the rest of your body. The healthier your gums are, the less likely bacteria will be able to spread to other parts of the body. Therefore, a healthy pair of gums means you’ll be protecting the rest of your body in the process. Oral health issues such as tooth decay and gum disease can cause mouth sores and tender, bleeding gums. According to studies conducted by the American Dental Association (ADA), oral infections can lead to many other serious ailments unrelated to your mouth such as heart disease, stroke and diabetes. However, if your teeth are straighter, and therefore easier to clean, you reduce your risk of all these diseases simultaneously. Not only can you be confident in how your new teeth look, but in your overall health as well. Consider a consultation with your dentist in Virginia Beach today to learn your eligibility for Invisalign treatment! Dr. Vinita John Folck, DDS, attended the University of Miami to earn her Bachelor of Science degree in Biology followed by her Doctor of Dental Surgery from the University of Texas Health Science Center in San Antonio. She is a member of the ADA, the Virginia Dental Association, and the Academy of General Dentistry. To learn more about her practice, contact her at (757) 499-9639 or visit her website. Comments Off on Get Straighter Teeth with Invisalign in Virginia Beach!